1 Smoke belched from the industrial plants in Donora, Pennsylvania. It was considered little more than a nuisance before October 1948. 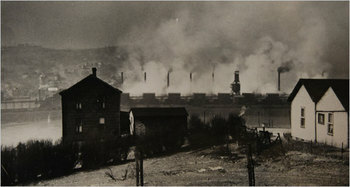 The U.S. Steel Corporation's zinc and wire plants in Donora employed thousands of people. Living with smog was a way of life there. 2 Residents didn't think much of hosing layers of dust off their homes and cars. Salesmen brought extra white shirts to work. The shirts would turn dingy before the day was over. All that came to an end in October 1948. A weeklong layer of blinding smog covered Donora. The pollution stung people's eyes. The smog was so thick the residents couldn't tell whom they were passing on the sidewalk. The smog was so thick the football players couldn't see their opponents on the field. Firemen couldn't find addresses to help those in need of oxygen. The smog was trapped in the valley. A rare weather condition called an inversion kept it there. 3 Eventually, the blinding smog took the lives of twenty Donora residents. It was the first air pollution event that actually killed people. This tragedy was a wake-up call for Americans. This event was the beginning of our nation's first clean air legislation. It was the first time that public officials recognized a direct link between air pollution and public health safety. The Donora tragedy and other smog problems provoked congressional hearings that led to the Air Pollution Control Act of 1955, the Clean Air Act of 1963, and the Air Quality Act of 1967.